Sorry about the lack of posts this week, everyone in the family had the stomach virus, I was the last one to get it, and finally starting to feel better. I haven't made a card for a few days, today's card I actually made for a little girl's 6th birthday at the end of last week, I hope she likes it. I used my new Sarah Kay stamp and colored with copics and prisma markers. 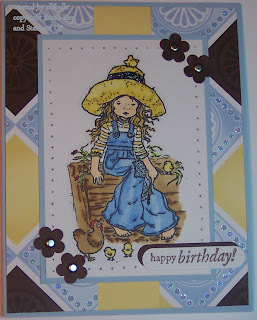 The sentiment is from Penny Black's clear set "Critter Party". The designer paper is from Hobby lobby, I have no clue who makes it though. I pretty much colored the image to match the paper. To finish the card off, I added the flowers (punched out with my flower trio punch) with brads, did some paper piercing along the edges of the main image, and addes stickles to the circles on the designer paper. Thank you for stopping by today, I hope you have a wonderful saturday! I love the color combo, and your image is beautifully colored! This is just as sweet as can be! Love this image and your coloring. Sweet card! Again, lovin' the flower punch. It adds a nice touch! Super cute cards, I was looking at the ones below and they are darling tooo!!! Very sweet...these always remind me of Holly Hobbie! Oh, this is so sweet!! Sorry to hear about the bug visiting your house....I thought surely I was getting it yesterday....I was really woozy....but luckily it passed so it must have been something I ate, lol! That image is too cute and your coloring is great! sorry to hear about everyone being sick but glad you're all doing better now!! Beautiful card, your coloring is great and i love the bling you added. Love your coloring job excellent!! Such a cute card! I just love those Sara Kay images. They are so sweet! Super cute! Your coloring is wonderful! I love these colors! Beautiful!